Students can use this 10-flap foldable to describe/define each property of matter, or give examples. 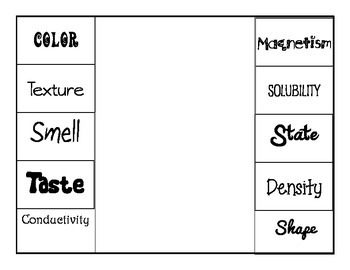 Could even be used as part of a lab activity, where students must fill in this information about a certain piece of matter. Aligned specifically to go along with NC Essential Standards for Fifth Grade, but applicable to many different grade levels!